Kelly: My initial motivation was to help children develop a love for, and commitment to, the practice. Now I’m motivated to assist with the integration of positive habits such as listening, patience, and helping others within the behavior of children. I believe in the potential of every child. I understand how emotional experiences shape our neural networks–the way we think. Within public classrooms my motivation is also to build a sense of respect in students for their public school teacher. I am dedicated to helping teachers who give so much to their students, communities, and schools. Our SCHOOL (Smiling Calm Hearts Open Our Learning) classes nurture respect and emotional security within classrooms. Is there a standout moment from your work with elementary school children? A gratifying moment is when I hear of or see a student applying teachings without my impetus. It is also gratifying to see the gradual conditioning of students’ learning within our SCHOOL classes. Once children learn the rules and boundaries of the SCHOOL classes, which typically takes four sessions, we have more classroom moments of taking a calm breath in and a calm breath out together. To see an entire classroom take a simultaneous calm breath in and out is very rewarding for me. I’m fortunate to sit in front of children and witness their development of self-regulation and more gentle attitudes, one breath at a time. More than 80 percent of the children I teach are Hispanic, with the remaining 20 percent mostly other minorities. Growing up in South Carolina and living in the south until my early 30s, I had little to no interaction with the Hispanic culture. I assumed these children would know Spanish better than I. This proved to be true! Other than this obvious fact, I truly was and remain open to each classroom. I only need to simplify English words of instruction for the Pre-K classes to better communicate the yoga lessons. Because children are strong visual learners, they pick up the lessons quickly as I exhibit posture, pace, and facial expressions. I find inner-city children quite open and eager to learn yoga/meditation. The first difference in teaching style is the acknowledgement that I’m a guest within the public school teacher’s classroom. I defer to the classroom teacher for acceptable choices for addressing disruption (talking, distracting peers). I ask for permission to show an image to reinforce the story told at the beginning of class, or if I may move a chair or easel to make more space. SCHOOL kids yoga classes always point to the leadership of the public school teacher. I may refer to the teacher as very patient with students, if the story told at the top of a SCHOOL class highlights developing patience. SCHOOL kids yoga classes often include students making a heart with their hands and sharing their calm heart with their public school teacher. I make myself insignificant, always emphasizing the positive qualities of the public school teacher. A second way my teaching style differs within public classrooms is that the theme or teaching of each SCHOOL kids yoga class is specifically tailored to the activities, skills, and behavior of daily school life. For example, I may tell a story about being very hungry after a full morning of teaching, and sharing my lunch with a stranger who needed food. Once we’ve established that it is good to be generous, and that being calm helps us give to others, I would then ask the students to think of ways they can be generous and give to their classmates and their teacher in their classroom. Our movements, postures, and meditations would also include positive affirmations about giving. What is the role of humor in your practice, in your classes? Humor makes its way into SCHOOL classes effortlessly from children’s comments, suggestions, and questions. I do not put on a show with children, or intentionally try to be funny. Simplicity and honesty make for an uplifting tone, especially as these children take the practice seriously and relate easily to the idea of using their calm breathing to keep a calm heart. The greatest challenge has been bringing the public up to speed on the fact that proper yoga/meditation practice is more than creating healthier and calmer bodies. Yoga/meditation practice must build caring and helpful dispositions that are evident within behavior. SCHOOL root teachings (patience, generosity, etc.) integrated within movement contribute to mindfulness and self-regulation. SCHOOL classes are quite simple, with emphasis on calm breathing and a calm heart to help build habits of positively adapting to people and life. Busyness, distraction, complaining, and emotionality can be re-patterned when one is more centered and calm. Children who are unable to self-regulate beyond a negative emotion have a more difficult time adapting, learning, and relating positively to others. It is of little use to our community if we produce high test scoring students with the absence of caring hearts. I believe our schools are the places to teach basic life skills that are secular and common to being good people. Never look at these children as less than yourself. Quite the contrary, look at these children as your teachers, helping you to grow. Exhibit and live the qualities you know they also have within themselves that are helpful for their classrooms, homes, and communities. There may just be a time in the future when you will lean on the kindness and compassion of these children as they are adults and you are in your senior years. If those teaching yoga in service to the community have a comprehensive understanding and approach to the practice (not an emphasis on physicality), we may be able to further innovate health and healing in America, while sustaining respect for the origins and purpose of the practice. Are you interested in building strong, engaged and resilient communities?Join us at the fourth annual Yoga Service Conference at Omega Institute on May 14-17, 2015. Author Rob Schware is the Executive Director of the Give Back Yoga Foundation and President of the Yoga Service Council. Each year, he issues a report on the state of yoga service — the work of bringing yoga to those who might otherwise never experience its transformational benefits. Read on for a look at what’s in store for 2015 and beyond, and a download link for this annual report. “My hope is that yoga will be more readily received by unique communities such as Native Americans, and more recognized by health care organizations as a complementary healing modality to modern medicine.” — Christy Burnette, founder and Executive Director of Conscious Community Yoga Association, Inc.
Others expressed hope that yogis will share this gift with special populations all around the world, and provide specialized yoga classes for people who find themselves at a homeless shelter, for people recovering from addiction, and for autistic children. How are we doing as a community to respond to these hopes? What new partnerships and entities, profit and non-profit, are stepping up to respond to the challenges? The Prison Yoga Project, which started at San Quentin State Prison through the work of James Fox, is a shining example of a well-studied program by the National Council on Crime and Delinquency (NCCD), which showed this is a cost-effective means to help with addiction recovery and impulse control. The NCCD study found that a little mindfulness training through yoga can redirect attention, increase emotional self-control and anger management. Over 800 yoga teachers are now teaching yoga and meditation in over 75 prisons around the world. In February, the Yoga Service Council and the Omega Institute will issue the first in a series of research reports on “Transforming Education Through Yoga.” This series was produced with research, input, and onsite collaboration from 23 leaders in the field of yoga and education. In October, the Yoga Service Council and the Omega Institute will also host leaders in trauma-sensitive yoga for veterans to produce a second report in the series, “Yoga for Veterans.” Key researchers, including Sat Bhir Khalsa and Bessel van Der Kolk, have committed to participating. The objective of this Service Week for Veterans is to co-create common goals for our community, share insight, and produce resources that will serve veterans, VA hospital facilities, and yoga service providers, producing a peer- reviewed report of best practices. In February, the first-ever Trauma-Sensitive Yoga and Resiliency Training to Benefit First Responders and Emergency Personnel will occur at the Sedona Yoga Festival – the first offering of a new Give Back Yoga program called Yoga for First Responders. Our police, firefighters, emergency medical personnel, and their families face behavioral health issues similar to those of combat soldiers, such as depression, PTS, anxiety, addictions, and suicides. The Sedona Yoga Festival/Give Back Yoga training aims to share skills and tools to help bring therapeutic yoga to at least 4,000 first responders nationwide. In May, social workers and yoga teachers will come together for a weekend at Omega Institute for the 4th Annual Yoga Service Conference to discuss how the yoga service movement can expand its work to support broader commitments to social justice. This includes addressing the “school-to-prison pipeline,” which channels thousands of low-income youth (particularly men of color) directly from failing schools into the criminal justice system. We will have compelling and direct conversations between social justice and contemplative practice in organizations — join me there! This year, Give Back Yoga is partnering with Conscious Community Yoga and the Sedona Yoga Festival to provide a DVD yoga resource for Native Americans, led by a Native American yoga teacher. The class will be structured for those new to yoga, and with potential health challenges kept in mind. Of primary concern are complications from diabetes, obesity, detox for drug and alcohol addictions. To reach our veterans with mindfulness practices, Gaiam and Give Back Yoga will commit to serve 100,000 veterans through mobile meditation apps. Yoga Journal Live, Give Back Yoga and Warriors For Healing will host a special event on Sunday June 28, 2015 on the Windsor Lawn of the Hotel Del Coronado in San Diego, CA. This distinctive and compelling event, called Warriors For Healing, is designed to bring greater awareness of the therapeutic benefits of yoga for veterans facing PTS, and will offer veterans who are seeking healing a pathway toward new meaning and empowerment in life. YogaGlo will support the Eat Breathe Thrive™ Facilitator Training course, providing facilitators with the knowledge, skills, and mentorship necessary to lead a yoga-based program for people struggling with disordered eating and negative body image. Nearly 80% of adult women feel dissatisfied with their bodies, and three out of four report struggling with disordered eating. The rates of body dissatisfaction among men have increased from 15% to 43% over the past three decades, and eating disorders have the highest mortality rate of any mental illness. As we partner with our program directors, our Advisory Board Members and influential yoga teachers to bring this powerful practice to the world, one person at a time, we are fostering new growth in several areas. This year, Give Back Yoga is partnering with the Farashe Yoga Center in Ramallah, 7 Centers Yoga Arts and American yoga pioneer Rama Vernon on a new global initiative to expand and harness the power of yoga in the West Bank and Gaza, supporting Palestinians’ exploration and use of yoga in everyday life. In May, lead teachers from these organizations will travel with Rama Vernon to the West Bank and work in partnership with Farashe Yoga Center to train up to twenty teachers. Following the training, these new teachers will introduce yoga to area residents through work in urban refugee camps, schools, hospitals, and other venues. Yoga is largely unknown among Palestinians. But over the past two years, more Palestinians — women in particular — have embraced the discipline as a way of coping with their daily stresses of the prolonged conflict, including commuting through military checkpoints, unstable employment, restrictions on movement and access, and political unrest. This initiative to foster yoga as a practice of peace in the West Bank will continue to grow in 2016, as Give Back Yoga and our partners host the first international yoga conference in the West Bank. Led by world-renowned yoga teachers, Palestine-based yoga teachers and practitioners will have access to hands-on workshops that will enable them to develop effective yoga programming for their students. Following the conference, there will be a one-week service opportunity for newly trained teachers to apply these principles in their lives and in the community. Based on continuing growth trends, we anticipate a growing demand from prison wardens who want more trained yoga teachers working in more prisons; and want specific programs for incarcerated veterans, for the staff and officers, and increased support for restorative justice programs. There’s a lot of work ahead of us. But eventually, we’re confident that we’ll see tens of thousands of yoga teachers and yoga therapists leaving their studios and sharing down-to-earth yoga tools with un-served and underserved communities. As an organization, one of Give Back Yoga’s key purposes is to serve as a gateway for yoga service. If you’d like to be a part of this movement for grassroots social change and healing, we invite you to visit us on the web, follow us on Facebook and Twitter, and subscribe to our monthly newsletters. Here’s to a bold, transformative, and prosperous New Year to you all! Images courtesy of Robert Sturman, Prison Yoga Project, Yoga For First Responders, Farashe Yoga Center and Niroga Institute. Download the annual report The State of Yoga Service: Looking Forward Through 2015. Katrina: I grew up with a great respect for the military. My dad was an officer in the Coast Guard and is a founding member of the Warrior’s Watch, and my brother served in OEF/OIF as a flight medic in the Air Force. My maternal grandfather served as a gunman in World War II for the British Canadian Navy and my paternal grandfather served as a lieutenant in the signal corps in the US Army. I was never in the military myself. I’ve had lots of jobs in various careers but chose to pursue yoga as my passion and career. Teaching yoga to the men and women who have dedicated themselves to service is a way to connect my two worlds and give back to a population that deserves a lot more respect and attention. I’m continually motivated by stories of what these people went through and how civilians treated them after their return. Is there a standout moment from your work with veterans? Simple moments hit me the hardest: a couple of weeks ago a vet told me that he noticed it’s easier for him to tie his shoes. It’s something most people take for granted, but it makes his day just a little bit easier. That’s huge. There’s another vet I work with who has a very hard time staying still physically and mentally throughout class. But he continues to practice, and he’s changing, even if he doesn’t realize it yet. I started watching his toes in savasana (corpse pose) and his record is 30 seconds of stillness. He gets better every time. During a yoga nidra (deep relaxation with inner awareness) practice, an OIF vet woke up suddenly and looked at me. After the practice, he shared that he had experienced a particular memory that he had only thought about one other time since Iraq, and that last time he had gotten extremely angry and physically aggressive. In this moment though, his relationship with the memory had changed into one of an observation instead of a reaction. Pretty cool! What did you know about working with veterans before you began teaching? What were some of the assumptions you had about them, and how have those assumptions changed? I walked into the VA the first time with the assumption that I was going to have to be very assertive to start a yoga program in a center that had never offered yoga before. I figured I would have to talk to a lot of people up the ranks and have a lot of information to back up my desire to teach yoga for vets. Because of these assumptions, I probably entered the VA a little on the aggressive side. I wasn’t going to take no for an answer. I brought my certificates, yoga resume, and a lot of verbal information about why our vets need yoga and no, I really don’t want any money from the VA.
With great timing, a veteran publication had printed an article about yoga for vets that same week. The lead therapist at the center brought the article to our second meeting and said he thought it would be a great idea. In a veterans’ yoga class, I don’t offer any assists or leave my mat. This was very challenging to start as I love offering touch in my vinyasa classes, but it wasn’t appropriate in the VA setting. Partially because of this, I was able to gain the trust of the people in my classes. I also encourage “community time” at the beginning of these classes. I set aside the first 10-15 minutes of class time to let everyone chat and connect. Sometimes they’re pretty quiet, but most weeks they’re chatty, telling stories about boot camp, war, bears, something someone saw about yoga, whatever comes up. I think this time to connect everyone on an intimate, comfortable (and sometimes crass) level before getting into breath and movement, is important in this kind of class. Just listening without judgment goes a long way in creating relationships built on trust. The greatest challenge in my teaching experience has been adapting a class to balance younger vets and veterans who have been out of the military and living in Boulder for a long time. I ask for a lot of feedback to develop a class that serves them the best, and this population really wanted more: more core work, more Sanskrit words, more challenging poses, more energy movement. We’re finding a way to walk the line of accessibility and tradition with a mix of people who have studied yoga, as well as those who are brand new. What advice would you give to anyone who is going to teach at a vet center? 1.) Know how you are going to present yourself and your information. Go in confidently, professionally, and with all the compassion you have. Leave judgment at the door. 3.) Bring materials for the staff to keep and look over. Offer your certifications and credentials, resume, printed articles and media, and any books that might shed light on yoga therapy for vets. 4.) Know your “why.” The first question everyone — therapists, friends, vets — asked me was, “Why do you want to work with vets?” Knowing your answer and having a concise way to explain it will help gain the trust of the vets and staff. 5.) Don’t take no for an answer. If you find resistance, ask them “Why?” Since yoga therapy is still so new, chances are the staff just isn’t that familiar with yoga or the effects of yoga therapy for veterans. Offer your materials, media, and your verbal skills to assure them that this is a positive, helpful therapy option. I want to see yoga as an integral part of the military: in training, in combat and in treatment. It’s such an important tool to offer anyone who has or might experience serious trauma. I want to see trained, talented yoga instructors creating a community in which yoga is accessible to everyone. How has this work changed your definition of yoga? Your practice? My definition of yoga is constantly changing. In this context, yoga is a way of inclusive, supportive living using the tools to mindfully handle stresses and traumas in a healthy manner, on a daily basis. My own practice has become more healing and intuitive through pranayama (yogic breathing) and meditation as a result. It can be very difficult to take your own advice as an instructor, but learning and living the breath and meditation practices is key to finding balance and healing, especially while working in a yoga therapy setting. Are you a yoga teacher who wants to work with veterans? Mindful Yoga Therapy’s new 100-hour certification program will lead you through a deeper understanding of how to support this population. Learn more at the Mindful Yoga Therapy website. This blog post comes from Liza Stacey, a psychologist and yoga teacher currently working in a mental health/psych ward in a men’s maximum security facility in Melbourne Victoria, Australia. She works there three days a week. Along with individual counseling and running programs on understanding and managing emotions, Cognitive Behavioral Therapy and distress tolerance, she teaches yoga and meditation classes twice a week. The classes introduce a new sequence of physical asanas each week, including poses for balancing mood, assisting sleep and helping with anxiety; as well as more invigorating asanas for assisting with depressive symptoms such as low energy and mood. After some physical yoga, different types of meditation techniques are taught, such as different breathing (pranayama) techniques, breath counting meditation, guided visual meditation and yoga nidra. Yoga has a direct link to the needs of people in the prison system; however, it still faces some blockers to the adoption in these environments. Through my experiences and training, I have seen the positive benefits of yoga in these environments. I have been working in the area of mental health/ psychology for over ten years (including as a Registered Psychologist for over 5 years), have been a yoga practitioner since I was 18 years old and have now completed my training as a yoga teacher. I have been working within the prison system for nearly four years now. Most of that time has been within a forensic mental health unit within a maximum security men’s prison in Victoria. When I first started practicing yoga, I experienced firsthand the amazing therapeutic benefits it had on my own stress levels, and started using yoga and meditation techniques to manage and cope whenever I had stressful times in my life. Traditionally, psychological therapies have been based around trying to change your thinking to change your behaviour and mood (e.g., Cognitive Behaviour Therapy). From around the year 2000, other therapies have started to make their way into mainstream use, such as Mindfulness, Acceptance and Commitment Therapy and Dialectic Behaviour Therapy/ Distress Tolerance. These therapies all use the basis of mindfulness meditation and breath awareness/ awareness of the present moment to assist in the change of mood and mental states. This is at the core of what yoga teaches, as well. Over the past few years I have seen more and more the openness of clients and also fellow colleagues to want to learn more about these therapies. To me, the blend of yoga and psychology makes sense in so many ways. Bringing this blend into the prison environment made even more sense. There is more to Yoga than just the physical practice: it is also the practice of breath awareness, the practice of quietening and stilling the mind, the practice of sitting in discomfort to get comfort, and the practice of impulse control. To practice yoga is to practice mindfulness. It is about understanding and compassion to ourselves and others. Yoga is also about developing awareness of self. It teaches you to step back and observe your thoughts and feelings and witness these as an observer, rather than being entangled in the thoughts. Developing self-awareness is the key to change, and yoga helps with this. To practice all aspects of yoga, we practice strategies which will assist to reduce anxiety, depression, worry, excessive rumination and anger, and increase our focus on the positive – all strategies that psychology teaches, as well. Think about what prison is: punishment and loss of freedom, leading to feelings of mental and emotional distress, distrust and agitation. This is coupled with men who have committed crimes and often have had a past of unhappiness, trauma and violence in the lives. What better place is there to be teaching yoga and the practices/ philosophies of yoga and meditation? Most men in prison experience trauma. Often, trauma has occurred in their lives prior to coming to prison (such as the trauma of the loss of attachment from their parents during crucial developmental years, or physical or sexual abuse, or even the trauma that years of substance abuse and crime can also bring). Plus, there is the trauma often experienced within the prison walls (the loss of family and relationships, the daily stress of survival, physical and sexual abuse by other prisoners and the threat of this). It makes sense that a practice such as yoga/meditation can assist in helping these men deal and cope with the trauma. There is more and more evidence mounting each year about the benefits of yoga practice to heal trauma. People who have gone through a traumatic period in their lives can be disconnected to their bodies, and so even the physical feel of a yoga mat underneath their hands and feet when doing downward dog can be hugely therapeutic for them. Most people who have lived through trauma experience high levels of anxiety, and so teaching breathing techniques and meditation can help to reduce anxiety significantly. Most people who have lived through trauma find it difficult to sleep at night — in fact, this is one of the most stated issues within the prison system. So practicing yoga nidra (deep relaxation exercise) and relaxation strategies/ relaxing yoga postures to do before sleep can help those who find sleep difficult. Teaching grounding exercises which men can practice in their cells at night if they cannot sleep can assist those who frequently wake with distressing nightmares. American prisons such as San Quentin State Prison in California have understood the value of adding yoga to their mainstream prison programs, and more evidence is coming out about the benefits of these programs for the prison population. The Yoga Education in Prisons Trust is an organisation assisting prisoners in New Zealand to learn yoga and meditation and so more and more people are getting exposed to the benefits of yoga within the prison environment. Each year, there are more and more studies in psychology and psychiatric journals about how yoga reduces distress in prison populations (e.g., a UK study published in the Journal of Psychiatric Research in 2013 found participation in a 10-week course of yoga improves behavioural control and decreases psychological distress in a prison population). Australian prisons appear to have not yet incorporated yoga and meditation techniques into the wider prison population. There are a couple of challenges to yoga in prison being more widespread. The first is the perception of yoga, and having yoga being run in prisons – for staff, prisoners and the wider community. Yoga may still be seen by men as being “for women only.” Yoga may also be seen by men as not being accessible to them, as they cannot “get their body into twisted pretzel shapes.” Men may also see meditation as being something that is “weak” and not for them. Yoga may be seen by prison staff and possibly the wider community as being a “relaxation exercise,” and not something that people who are serving time for crime should have access to. They may see it as a reward, rather than as part of treatment and therapy. To counteract this perception, more education should be done about the benefits of the programs and what they teach. Yoga should be sold more as a means of treatment for stress, anger, distress tolerance, anxiety, depression and trauma. Yoga should be seen as more than just the physical practice, but as a teaching of breath awareness, relaxation, mindfulness and meditation. The empirical evidence of mindfulness is now understood and well known, and has been incorporated into many programs. However, this can be further incorporated by increasing the practice and teaching of yoga within the prison and within the programs. I have seen and heard firsthand stories of men in prison who are suffering from psychiatric illness and PTSD reporting that since they have started practicing meditation, breath awareness and yoga nidra, their auditory and visual hallucinations have significantly reduced, and their nightmares have reduced and/or they are able to manage them much better. I am hoping to begin measuring and evaluating the effectiveness of yoga within the prison population at the psychosocial medical ward of the prison where I work as a psychologist. The program I will be teaching, measuring and evaluating will incorporate the physical practices of yoga, as well as the teachings of mindfulness and distress tolerance — which in fact are the philosophies of yoga, blended into the teachings of modern day psychology and anxiety and depression management. Bilderbeck, A.C; Farias, M, Brazil.I, Jakobowitz. S., and Wikholm. C.. Participation in a 10-week course of yoga improves behavioural control and decreases psychological distress in a prison population. Journal of Psychiatric Research, 47 (2013) 1438-1445. Van der Kolk.B. The Body Keeps The Score: Brain, Mind, and Body in the Healing of Trauma. 2014. The Penguin Group. 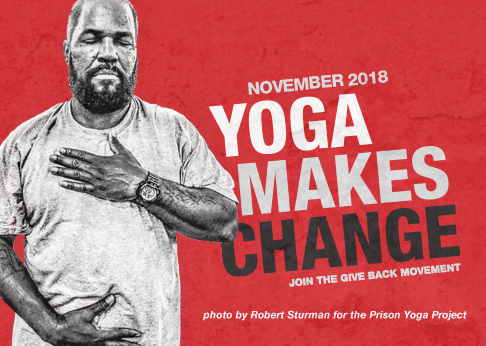 Help Give Back Yoga to put yoga and mindfulness guides in the hands of 1,000 prisoners this year by purchasing the Prison Yoga Project book Yoga: A Path for Healing and Recovery for yourself or on behalf of a prisoner. In the 1980s, Francie Winters began working with at-risk youth; her hope was to empower their lives. In the 90s, Francie’s work, “morphed into teaching mindfulness and yoga,” something she continues to do in Pahrump, Nevada, where she lives with her husband. In the latest interview for our yoga service series on the Huffington Post, Executive Director Rob Schware talks with Francie about the importance of empowering the underserved, and what she has learned from working with such populations. To learn more about what continues to motivate Francie’s work and her thoughts on the future of service yoga, read her full interview on the Huffington Post. Can you join us in Giving Back from your mat? By donating the cost of one yoga class ($15) per month, you can give the gift of yoga to those who need it most – like veterans, first responders, prisoners, at-risk youth and more. Please join the Give Back Yoga family today by sharing a monthly donation! After spending time sharing the gift of yoga overseas, Lara Land came back to New York with an important goal in mind: to make a difference in her community. Since her return in 2009, Lara has opened her own yoga studio, Land Yoga, in Harlem and teaches senior citizen participants (and “non-participants”) yoga classes once a week at the Food Bank. In the latest interview for our yoga service series on the Huffington Post, Executive Director Rob Schware talks with Lara about her first experiences with yoga service, as well as the continuance of her service. To learn more about what continues to motivate Lara to give back to the community and her thoughts on the future of yoga service, read her full interview on the Huffington Post. Anyone and everyone can play a role in giving back through yoga. Learn about the many ways you can give back by subscribing to the Give Back Yoga newsletter (and check your welcome email for a 50% discount on a MP3 download of Deep Relaxation: Yoga Nidra). Can a “slim white yoga teacher” play an authentic role working towards social justice? And are studio classes like “Yoga for People of Color” divisive, or supportive? In our latest interview for our yoga service series on The Huffington Post Blog, radical wellness coach and social activist Jardana Peacock takes on the tough questions. For more about Jardana’s work and her advice for teachers and studio owners who want to build community, read her full interview on The Huffington Post. In 2013, Peggy Hong moved to Detroit, MI, where she began “embracing the path of a ‘yoga nun.’” Peggy is part of a growing movement, incorporating themes of social justice into her work as a yoga instructor. In the latest interview for our yoga service series on The Huffington Post, Executive Director Rob Schware talks with Peggy about her work with this movement, including the “Community Gift” pay-what-you-can classes that she teaches. To read more about what motivates Peggy’s work and her advice to others interested in teaching Community Gift Yoga classes, read her full interview on The Huffington Post. Can you join us in Giving Back from your mat? By donating the cost of one yoga class ($15) per month, you can become a Sustaining Member of Give Back Yoga, and help us to share this transformational practice with those who need it most — like veterans, first responders, prisoners, at-risk youth and more. Join the Give Back Yoga family today!